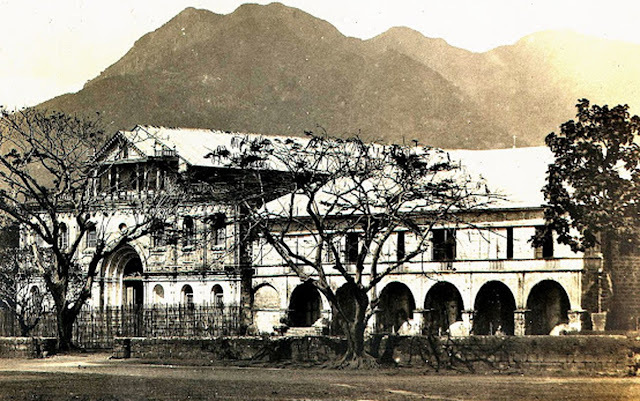 The Church and convent in Tanauan, taken in the early 1900s. Image source: “Everett Thompson Photograph Collection” of the University of Michigan. The story is also best taken with a grain of salt given the political climate in the then-town of Tanauan in the early fifties when the source document was written. A Laurel was mentioned in the story, and given that Dr. Jose P. Laurel was very much in the political limelight during and in the years immediately after the war, and not always for the right reasons, the motives for the story’s inclusion in the source document have to be among the considerations. At any rate, according to the story, one Antonio Villapando, supposed to have been among Tanauan’s prominent citizens, was elected “Capitan Municipal” or Town Captain. The holder of this position was “elected from among the ranks of the ‘principalia’ by 12 senior “Cabezas de Barangay” (heads of barrios) and performed both administrative and judiciary functions. Prior to 1895, this position was known as “Gobernadorcillo.” In the present day, the closest government position to it is that of the Mayor2. As soon as Villapando was out of earshot, the gamblers all started talking about how the soon-to-be “Capitan Municipal’s” statements were “a challenge to the prestige of the Tapia family.” Thereupon, Doña Maria asked for her coach (or horse-drawn carriage) and asked to be immediately taken to Manila. They were assured before long that Villapando’s election would be nullified and one Don Leocadio Laurel would instead be appointed Tanauan’s next “Capitan Municipal.” An entry in a genealogy web site4 says that a Leocadio Remoquillo Laurel was a half-brother of Dr. Jose P. Laurel and was born sometime between 1854 and 1914. This is one of those things, of course, that cannot be taken at face value. Since use of the title “Capitan Municipal” became effective only in 1895, then we take it that this incident occurred between 1895 and 1898, when Spanish rule in the Philippines ended. The “Capitan Heneral” in question, therefore, would have to be one of Ramon Blanco, Camilo de Polavieja, Jose de Lachambre or Fernando Primo de Rivera5. If, indeed, Laurel was born in 1854, then he would have been in his forties at around this time and probably the right age to be a “Capitan Municipal.” Before long, or so the story went, orders to suspend Villapando’s assumption of public office and the appointment of Laurel as the next Town “Capitan Municipal” of Tanauan were handed to Doña Maria. She rushed back to Tanauan and ordered for a fiesta to be held in celebration Laurel’s appointment. As the story went, she became “Doña and Capitana Maria overnight” because Laurel was her husband. The narration was ambiguous, however, and did not state if she was already married to Laurel or if they got married after his appointment. The story concluded with the statement that the game of “panginggue” continued to flourish as it had done in the past. As said, however, the veracity of this story is very much in question. For the record, there is no Leocadio Laurel listed as among the mayors of Tanauan. Instead, the one listed in the time range is one Sixto Gonzales Castillo (1892-1898)6. 4 “Leocadio Remoquillo Laurel,” online at Geni, no longer available. 5 “Governor-General of the Philippines,” Wikipedia.